Composer, singer, actor, author and environmentalist, Sting, will be the musical guest at the Everglades Foundation's Fifth Annual ForEverglades Benefit on Friday, February 12, at The Breakers in Palm Beach, Fla. Tennis superstar John McEnroe will serve as master of ceremonies for this year's star-studded benefit, which will include cocktails, dinner and a live auction. Jack Nicklaus will serve as Honorary Chair. Cindi and Nick Bollettieri, Sonia and Paul Tudor Jones II, Elaine and Ken Langone, Polly and David Ober and Lia Reed serve as event co-chairs. "Advocates of Everglades restoration understand how important it is to sustain the momentum we experienced over the last year," said Kirk Fordham, CEO, Everglades Foundation. "How can we top this year's benefit? We can convince those who love this environment to come and enjoy great entertainment in support of a cause that has generated significant success over the last year with key Everglades restoration projects breaking ground. We now have a showcase event that really raises the bar in support of the science, advocacy and outreach needed to save America's Everglades. The annual ForEverglades Benefit brings together supporters from all across the country who understand the importance of restoring this one-of-a-kind ecosystem. It has become one of the hottest tickets of the season." Sting rose to universal acclaim as the lead singer and bassist for the rock band The Police in the late 1970s and early 1980s, scoring several No. 1 hits, including 'Roxanne', 'Every Breath You Take', and 'Message in a Bottle'. The group earned five Grammy Awards, two Brits and an induction into the The Rock and Roll Hall of Fame. Sting's successful solo career produced an additional 11 Grammys; two Brits; a Golden Globe; an Emmy; three Oscar nominations; Billboard Magazine's Century Award; and MusiCares 2004 Person of the Year. His latest album, 'If On a Winter's Night...' features a collection of carols, lullabies and hymns spanning five centuries and was released in October 2009 on Deutsche Grammaphon. A committed global activist, Sting's support for human rights organizations including Amnesty International and Live Aid, mirrors his art in its universal outreach. He founded the Rainforest Foundation in 1989 with his wife, Trudie Styler, to support protection of the world's rain forests. John McEnroe has won seven Grand Slam tennis singles titles, nine Grand Slam men's doubles titles, one Grand Slam mixed-doubles title and was inducted into the International Tennis Hall of Fame in 1999. After a 12-year absence from the professional tour, McEnroe returned to top-level doubles competition in 2006 and became the oldest male player to win an ATP title in 30 years when he won the SAP Open at San Jose. As well as being a distinguished athlete, McEnroe's commitment to and passion for the environment and conservation has been unwavering, evidenced by his tenure as a Riverkeeper board member. The Everglades Foundation Benefit has attracted many prominent supporters since its inception. Gloria Estefan and the Miami Sound Machine performed last year, and South Florida writer and journalist Carl Hiaasen was honored. Past ForEverglades performers and attendees have included Jimmy Buffett; Thalia and Tommy Mottola; Miami Dolphins owner Stephen Ross; Daryl Hall and John Oates; Diana Ross; John Mellencamp; Chris Evert; Christine and Steve Schwarzman; Audrey and Martin Gruss; and Lydia and Robert Forbes. "This has been an extremely positive year for America's Everglades restoration," added Fordham. "A string of key projects are breaking ground, renewing hope for the millions of Floridians who enjoy the recreational opportunities and economic benefits of the Everglades." Individual event tickets are available from $1,000 and include preferred seating and donor recognition in the event program. Table sponsorships are from $10,000 to $100,000. The Foundation's board funds all of the organization's fundraising and administrative expenses - ensuring that 100 percent of each donation goes directly to Everglades restoration science and outreach programs. For more information, contact Melissa Ray at (305) 251-0001, ext. 222; Debbie Fife at (212) 245-6570, ext. 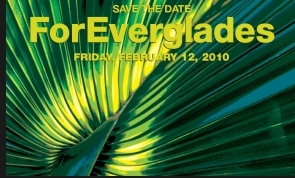 20; or send an e-mail to everglades@eventassociatesinc.com or visit www.evergladesbenefit.org. More than seven million people live in the Everglades watershed and depend on its natural systems for their livelihood, food and drinking water. Florida's boating, tourism, real estate, recreational and commercial fishing industries all depend on a healthy Everglades ecosystem, supporting tens of thousands of jobs and contributing billions to our economy. Its waters flow through the Everglades National Park, Big Cypress National Preserve, Ten Thousand Islands National Wildlife Refuge, Biscayne National Park and John Pennekamp Coral Reef State Park. Together, these parks draw several million visitors each year contributing hundreds of millions of dollars to Florida's tourism economy. The Everglades Foundation, Inc. is a 501(c) (3) not-for-profit, charitable organization dedicated to protecting and restoring one of the world's unique natural ecosystems that provides economic, recreational and life-sustaining benefits to the millions of people who depend on its future health. Since 1993, the Everglades Foundation has played a leadership role in advancing Everglades restoration through the advancement of scientifically sound and achievable solutions. The Foundation seeks to reverse the damage inflicted on the ecosystem and provide policymakers and the public with an honest and credible resource to help guide decision-making on complex restoration issues. For more information, please visit www.evergladesfoundation.org.